Keeping our Environment Pest Free, please be informed that TMD will be undertaking a monthly pest control program (fogging method) for external areas and private gardens to control mosquito and vermin populations. The program will be implemented starting on Saturday, 1 September 2018 (please see below schedule). - TMD will assign officials to implement the spraying at no charge. - Keep your pets safely from spraying activities. - Keep Children and infants safely away during fogging and attend to them. Your active participation in this program will be much appreciated. In case of rain, the pest control schedule will be shifted to the next day. The Rodent Control program will be carried out on a routine basis. For further information please contact our Call Center at (021) 55 777 557. Thank you. Thank you for your support and loyalty in using the Lippo Village Executive Shuttle Bus transportation services, both external and internal. To improve services and your comfort, please be informed that starting on Saturday, September 1, 2018 the Lippo Village Executive Shuttle Bus Terminal will be moved to Maxx Box Lippo Village parking area. Please enter through the area next to Bebek Bengil Restaurant. The operational schedule of the Executive Shuttle Bus will be the same as the existing schedule. If you need further information, please contact our Call Center at (021) 55 777 557. Thank you for your understanding and cooperation. To improve our services, we will doing routine cleaning of pipes for drinking water at all Lippo Village Central & West on Tuesday - Wednesday, 28-29 August 2018, which can affect the quality of the water that we distribute. 2) Changing of water quality. Please keep some of the water in your storage for any urgent needs. However, we will provide a standby water-tank, please call our duty officer for Emergency at 0800 1900 911 should you need additional clean water. If the water supply back to normal, please flushing the water before you use it. Please contact our Call Center at 5577-7557 if you need further details and information. Thank you. 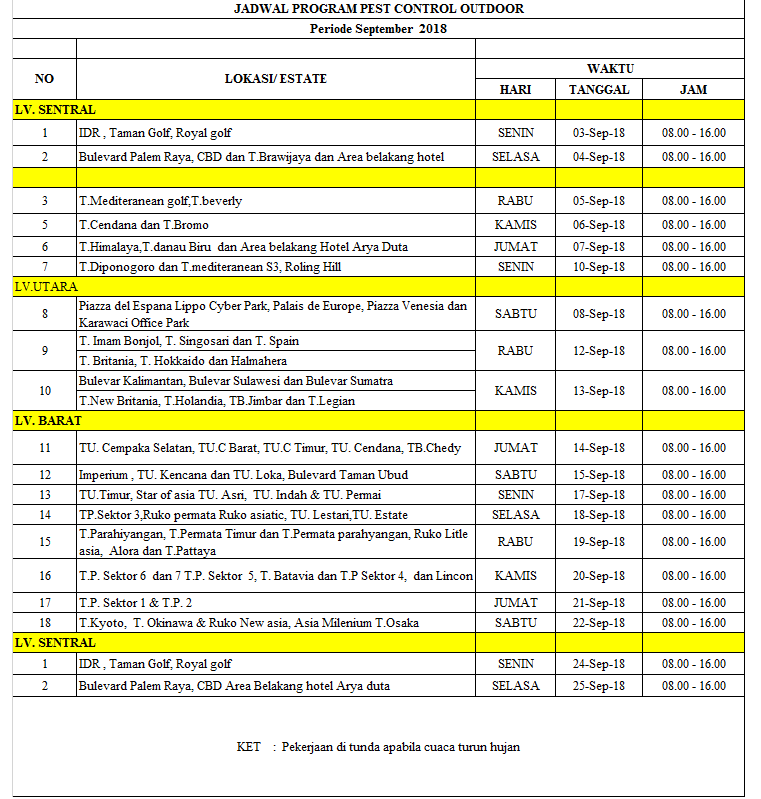 Please be informed that the schedule and route of the Parade in Lippo Village to commemorate the 73rd Independence Day of Indonesia, will be changed to 2 pm until 4 pm on Thursday, 16 August 2018. Marching Bands, floats followed by participants from various companies, institutions and schools in Lippo Village will be joining the civic parade from Maxx Box to Maxx Corner Lippo Village. During the Parade, we will partially close the road of Jalan Jendral Sudiman (in front of Maxx Corner Lippo Village). Westbound Jalan Jendral Sudirman will remain open except for one lane which will be reserved for emergency vehicles (ambulance). For those who are coming from Lippo Village West going to Jakarta, please use the road behind RSU Siloam. We apologize for the inconvenience caused due to the traffic density around the area and the traffic flow rearrangements. Rest assured we will have our duty officers to control the traffic, please observe traffic signage and directives from our security officers. This is our annual Parade to celebrate the Independence Day of our beloved country and we invite all residents/ communities in Lippo Village to join the festivities. If you need further information, please contact our Call Center at 021-55 777 557. Your support and active participation will be much appreciated. Merdeka !!! Commemorating the 73rd Anniversary of the Independence Day of Republic Indonesia on 17 August 2018, please be advised that residents of Lippo Village are required to raise the Indonesian Flag in front of the house from 10 to 24 August 2018. Your participation in celebrating this national event in Lippo Village would be highly appreciated. Please contact our Call Center at 021-55 777 557 should you need further information.